For some reason Mayor Emanuel became a bit testy when Fox Chicago asked him last week about his habit of finding time to meet with big donors and wealthy Wall Street guys, which Ben Joravsky and I detailed in a Reader cover story. First of all, the mayor said (see the two-minute mark of this video), he meets with lots of people who aren't on the schedule, including firefighters he chatted with at a fire station recently. 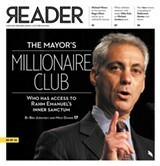 "I don't think they're fat cats," Emanuel said. As for the people he meets with who are fat cats—well, the mayor didn't really talk about them, except to suggest that they're part of his overall strategy to keep Chicago moving forward. No, wait—my mistake. He didn't say that. It was Mayor Daley who wanted to keep Chicago moving forward. Mayor Emanuel wants to break from the past. He wants to focus on "shaping our city's future." "I'll go anywhere to create jobs and economic opportunity in the city of Chicago," he told the guys at Fox Chicago. Mayor Emanuel still hasn't explained—at least to us—how exactly the meetings with donors are helping the city. But that doesn't mean they're not. In fact, we've heard from a number of other readers upset with us for wondering if there's any other possibility. Some of these readers don't even work for the mayor. We've also heard from lots of people on the other side: they're convinced that we were suckers for thinking the mayor would be interested in hearing from anyone but rich guys. I guess they never heard Emanuel mention that his Uncle Les was a Chicago cop. Of course, the reason we're able to debate the meaning of the mayor's schedule is that we've been able to take a look at some of it. And that's because the city released portions after Ben and I submitted a Freedom of Information Act request and followed up with weeks of almost-daily calls and e-mails. In contrast, President Barack Obama's staff regularly posts a log of visitors to the White House—meaning it's easier to see who conferred with Emanuel when he was the president's chief of staff than during his time as mayor. Emanuel appears intent on keeping it that way, though he's repeatedly vowed to bring unprecedented transparency to City Hall. At a press conference this afternoon, I asked if he'd considered creating a public log of visitors and meetings like the one at the White House. The mayor was calm. He answered without spin or equivocation.